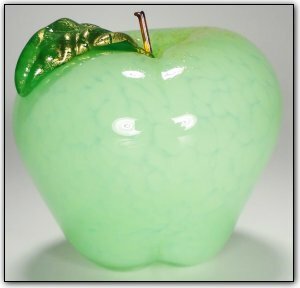 This elegant handblown glass apple is a lovely light green and features real 24k gold leaf on the leaf. Treat yourself to this delicious apple, or it would also make a perfect gift for a very special teacher. Or maybe even give it to your doctor at the next visit, after all, an apple a day keeps the doctor away! **SPECIAL SHIPPING NOTE** Our shopping cart charges a flat rate $40 shipping on all items. However, this apple is smaller and will only cost $20 to ship. We are currently unable to edit the flat rate amount, so upon receiving your payment with the standard $40 S&H we will send an immediate refund $20 to account for the discounted shipping on this item. **SPECIAL CUSTOM ORDER NOTE** Please inquire if you would like multiple apples or perhaps a red delicious or another color. The artist would be happy to make you a custom bunch of your very own apples!